The Century handle set paired with a Lattitude Lever in Bright Chrome is ideal for your front door, the place where security and style meet. To ensure your homes security, all Schlage front entry handlesets are precision-engineered, easy to install and built with a rugged all-metal chassis. And to compliment your homes style, Schlage offers a wide variety of different designs and finishes from simple and classic to sleek and contemporary. Antique Brass Storm Door Lever Handle Set The deluxe lever style storm door handle features a simple curved design that compliments a wide range of decor styles. This elegant and easy to operate handle will replace the basic push button handle that you may have on your screen or storm door. The screw posts must be 1-3/4 in. apart for a perfect fit. The interior latch features an easy opening push movement. The inside push handle does not have a lock. A separate key lock is available (SKGLK) which complements the appearance of the outside handle. This handle set includes everything needed for an easy installation and will fit on doors from 1 in. to 2-1/8 in. thick. 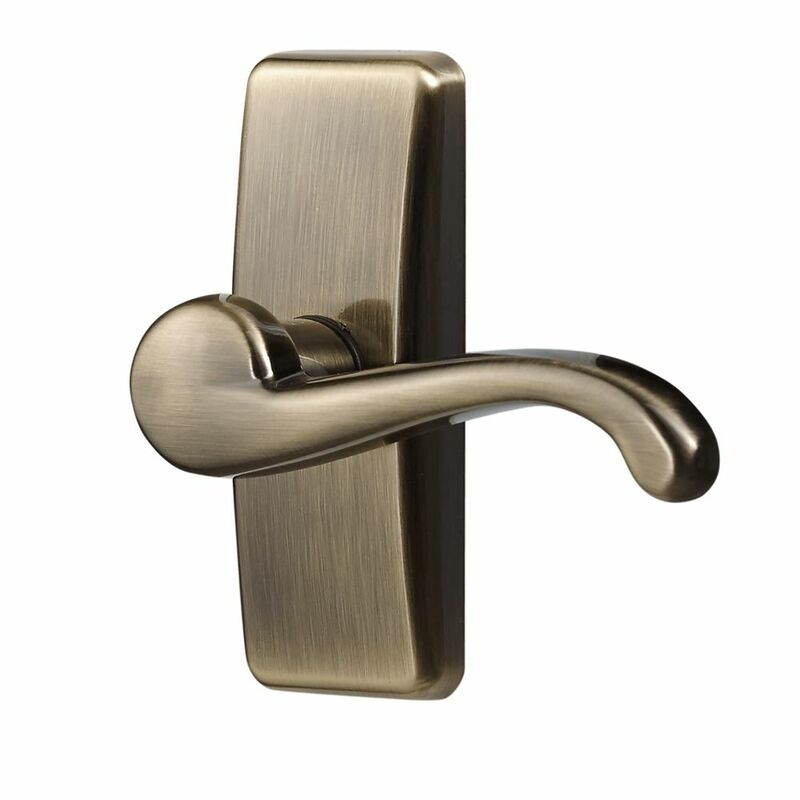 This zinc die cast handle with a long lasting finish will provide an added touch of class to any storm or screen door. Ideal Security has been supplying quality storm and screen door hardware to door manufacturers for over 50 years. Antique Brass Storm Door Lever Handle Set is rated 4.0 out of 5 by 11. Rated 1 out of 5 by John from Door handle has no lock. Not "ideal". ... Door handle has no lock. Not "ideal". Rated 5 out of 5 by NewJerseyGary from Although I had to mount the Handle Set in a new position, the installation was fairly simple and ... Although I had to mount the Handle Set in a new position, the installation was fairly simple and problem free. I'm quite satisfied with the quality of the product. It feels solid, and there is no 'play' when you press the latch or turn the handle. Of course time will tell how the brass ages, but I'm quite satisfied with my purchase. Rated 3 out of 5 by xxxx from Says it fits any size storm door---not so. Too wide for my storm doors and had to return. Outside... Says it fits any size storm door---not so. Too wide for my storm doors and had to return. Outside of that the product has excellent craftsmanship. Rated 5 out of 5 by Jake77 from Great quality. Pleased with various size hardware provided so I... Great quality. Pleased with various size hardware provided so I could get my installation just right. Well done! Went to various other hardware stores and Home Depot online had exactly what I needed. Rated 1 out of 5 by Stacey from Does not have a lock.... Does not have a lock. Rated 5 out of 5 by Lisa from Great if you are unsure of size needed and simple... Great if you are unsure of size needed and simple to install. Bought another for mom and will buy one more!